​Do not sign the Hauraki Settlement tomorrow. Do it properly! 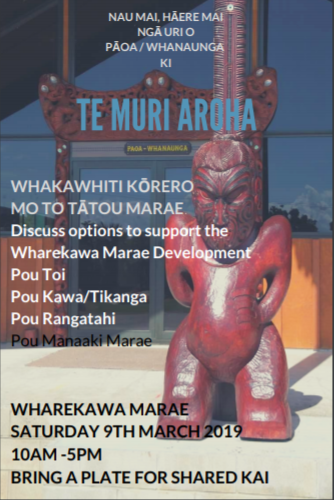 It is with a heavy heart the Iwi Trust inform you that our Negotiator has now notified us he is moving to sign the Hauraki Deed of Settlement tomorrow without proper notice, consultation or undertaking of the commitment made at the Hui-a-Iwi in Manukau on the 25 Oct 2018. 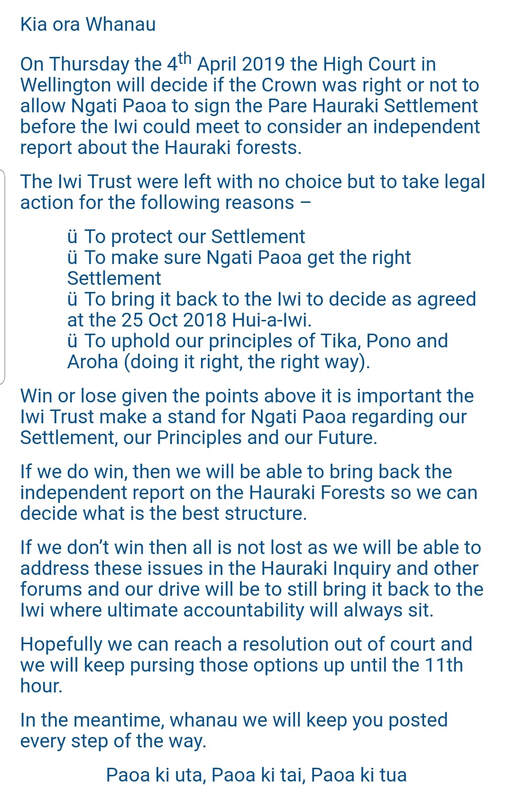 At the Manukau Hui-a-Iwi held last year on 25 Oct 2018 it was agreed that a Hui-a-Iwi would be held to consider the independent report on the Hauraki Forests once it was completed before deciding whether to sign or not. The fact is the report is not completed. 7 Iwi out of 12 have not signed the Hauraki Settlement. One of the main reasons is the concern about the commercial structures and how they don't work. The agreement at the Huia-a-Iwi at Manukau last year to call a Hui-a-Iwi to consider the independent report once its finished qualifies the mandate of the negotiator to sign. We have made the Crown and the Minister aware of this. Even though we ratified the Hauraki Settlement the mandate to sign has been qualified. As explained by our Negotiator Morehu at the Hui in October last year this is no different to what we did in 2012 during the Tamaki Settlement. We ratified the Tamaki Settlement but as an Iwi we agreed not to sign it until the issues that came up were resolved. When they were resolved we signed. Whanau we are asking for the same common sense and approach to apply again here in the Hauraki Settlement. The rush to sign tomorrow only serves the Crown and other Iwi who have signed (only minority) to ‘shore-up’ their case in the Tribunal Hearings. That is what this is really about. That is why they are rushing us to sign tomorrow. The Crown and other Iwi are worried it will loose the Tribunal Hearings next month and they desperately need Ngati Paoa to sign. Whanau we don’t need to be involved in the Hearings because we have already resolved our overlapping claims with Taurnaga Iwi. But rushing to sign will break those sacred agreements Ngati Paoa made with other Iwi. There is a proper process to undertake before signing to preserve those relationships. Rushing off to sign like this is not Tikan or Pono and lacks leadership and Rangatiratanga. Some of you may have received a TXT from Hau Rawiri about trying to sign off on the Hauraki Settlement tomorrow. Firstly, Hau is not a properly mandated negotiator as reported at Hui-a-Iwi and Marae committee meetings. Secondly the information in his message is incorrect. Third, the TXT from Hau exposes Ngati Paoa and Morehu as the mandated negotiator to potentially serious legal action and significant commercial and cultural consequences. Finally, the signing of a Deed of Settlement should be a cause for celebration. Instead a TXT at the last minute as notice is unprofessional and turns the signing into what looks like a backroom deal and fake photo opportunity. It appears the sudden rush to sign is because of the pressure from the Crown and other Iwi to shore up their position in the Urgent Waitangi Tribunal cases taken against the Crown by Tauranga, Waikato Tainui, Ngati Whatua Orakei and other Iwi. We shouldn't be involved in the hearings because we have already resolved our overlapping claims with Tauranga when we signed our Kawenata Tapu at Maungatapu marae. Signing tomorrow will trample on that agreement if the proper tikanga process is not followed. What is the rush to sign? Why rush to sign when the report is not finished? Why isn't it being brought back to the Iwi as agreed? Why is Ngati Paoa negotiators breaking their word and Kawenata with other Iwi? As a Board we have strongly urged our Negotiator Morehu not to sign given the matters raised above. As a Board we have asked to meet with him to fully consider the matters raised. As a Board we have advised the Minister we do NOT support the signing. Especially when we were given time to consider the report. 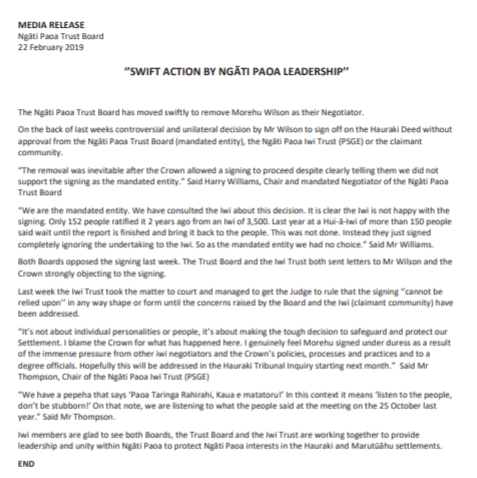 The Iwi Trust Board is trying its hardest to protect the interests of Ngati Paoa in this settlement process. We are being pressure internally by Iwi members and other Board’s we are also being bullied by the Crown and other Iwi but at the end of the day rushing off to sign in this way is not Tika or Pono and seriously brings the mana of Ngati Paoa into disrepute as other Iwi we signed Kawenata Tapu question our integrity and those who signed it from Ngati Paoa. If it goes ahead tomorrow we strongly advise whanau not to support the signing tomorrow and to wait until the proper process has been completed. No doubt some will show but the reality is the majority of Ngati Paoa does not support the signing and see it for what it really is a façade at our expense. For this reason outlined above and others we will communicate over the coming hours (as we literally only have hours) and hopefully days (if common sense prevails and the signing is postponed for now). The full Board have unanimously opposed the signing board and have informed the Crown and Negotiator. With the independent report less than 2 or 3 weeks away from being completed the Board is trying its best to protect the Settlement and the interests of Ngati Paoa in the Hauraki and Marutuahu Settlements. We will be posting our media release and other communications shortly so please watch this space as we keep you updated. 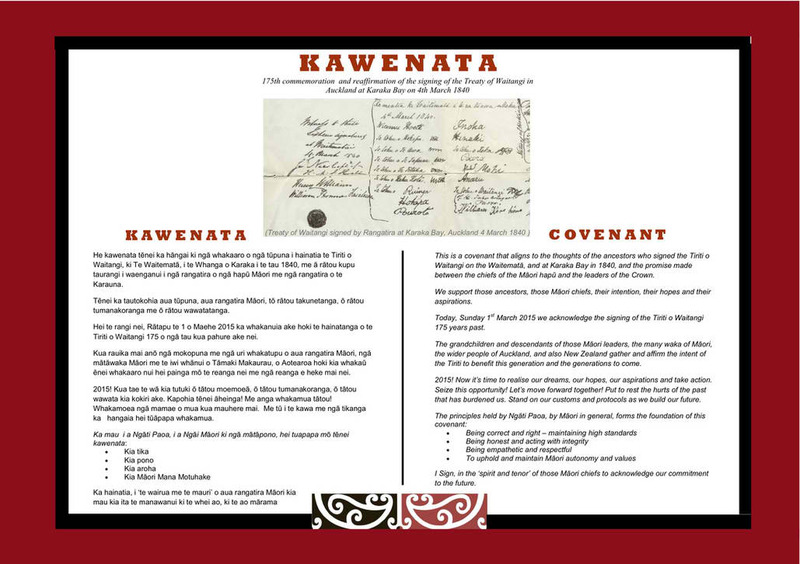 In recognition of the fact that Ngati Paoa were the first iwi to sign the Treaty of Waitangi in Auckland in 1840, a Kawenata was signed 175 years later at Karaka Bay on Sunday 1st March 2015. The kawenata embraces our values of Tika, Pono and Aroha.